No book before this one has rendered the story of cigarettes -- mankind's most common self-destructive instrument and its most profitable consumer product -- with such sweep and enlivening detail. Here for the first time, in a story full of the complexities and contradictions of human nature, all the strands of the historical process -- financial, social, psychological, medical, political, and legal -- are woven together in a riveting narrative. 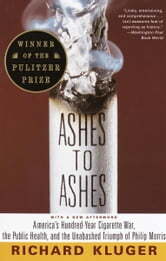 The key characters are the top corporate executives, public health investigators, and antismoking activists who have clashed ever more stridently as Americans debate whether smoking should be closely regulated as a major health menace. We see tobacco spread rapidly from its aboriginal sources in the New World 500 years ago, as it becomes increasingly viewed by some as sinful and some as alluring, and by government as a windfall source of tax revenue. With the arrival of the cigarette in the late-nineteenth century, smoking changes from a luxury and occasional pastime to an everyday -- to some, indispensable -- habit, aided markedly by the exuberance of the tobacco huskers. This free-enterprise success saga grows shadowed, from the middle of this century, as science begins to understand the cigarette's toxicity. Ironically the more detailed and persuasive the findings by medical investigators, the more cigarette makers prosper by seeming to modify their product with filters and reduced dosages of tar and nicotine. We see the tobacco manufacturers come under intensifying assault as a rogue industry for knowingly and callously plying their hazardous wares while insisting that the health charges against them (a) remain unproven, and (b) are universally understood, so smokers indulge at their own risk. Among the eye-opening disclosures here: outrageous pseudo-scientific claims made for cigarettes throughout the '30s and '40s, and the story of how the tobacco industry and the National Cancer Institute spent millions to develop a "safer" cigarette that was never brought to market. If It Wasn't For The Customers I'd Really LIke This Job: Stop Angry, Hostile Customers COLD While Remaining Professional, Stress Free, Efficient, and Cool As A Cucumber.